A medium to large (up to 1,062 mm or 42" in total length excluding rattle) rattlesnake with black blotches on a dark gray-brown to black background. Young have prominent brown blotches and facial markings on a light gray background. Coloration gradually darkens as the animal ages. Some adults appear solid black with thin white, yellow, or orange crossbars on the back. The rostral scale usually comes into contact with more than 2 internasal scales. The pupils are vertically elliptical and the dorsal scales are keeled. The base of the tongue is purple. The neck is slender and the head is broad and triangular. On the end of the tail is a rattle composed of a series of loosely interlocking keratinous sections. A new section is added each time the snake sheds its skin. This snake is found across the central mountains of the state from below the Colorado River in northwestern Arizona, along and below the Mogollon Rim, through the White Mountains, and down into the Pinaleño, Galiuro, Santa Catalina, and Rincons. 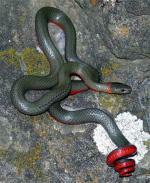 It is found at elevations ranging from about 4,000' to over 9,000'. It inhabits a variety of biotic communities in Arizona including Semidesert Grassland, Interior Chaparral, Great Basin Conifer Woodland, Madrean Evergreen Woodland, and Petran Montane Conifer Forest. It is often found in or near rocky drainages with permanent or semi-permanent water but is also encountered on open, rocky slopes. It is primarily diurnal but can be active around the clock when conditions are favorable. This ground-dweller hibernates alone or in communal dens during the cold months of winter and late fall. Like the other "pit-vipers" (members of the subfamily Crotalinae) this snake uses heat sensing pits (one on each side of the face between the eye and nostril) to detect warm-blooded predators and prey. 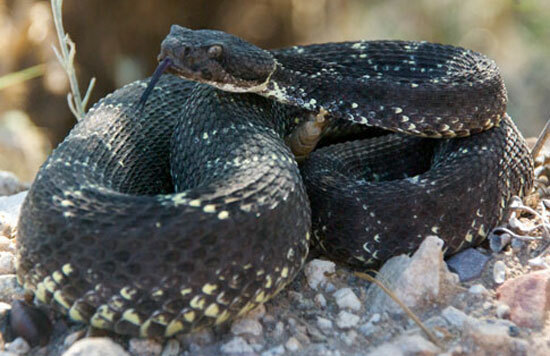 The Arizona Black Rattlesnake eats rats, squirrels, mice, lizards, and birds. It uses venom injected through long, hollow, retractable fangs to kill and begin digesting its prey. It gives birth in summer.